The wireless computing platforms are expected to have a favorable effect on enterprises as they can utilize new and innovative mobile operating systems, end user devices and wireless network infrastructure. Where personal computers shifted computing power to the desktop from mainframes, wireless devices supplement laptops and desktops, giving employees powerful end user devices that are well-connected and offer vital business data owing to integration with enterprise information systems. The wireless computing platforms and devices act as trendsetters in the wireless market and are rapidly becoming an essential ingredient amongst information power users. With initial functions such as synchronized calendars, contact management, wireless messaging and email that can be preinstalled on these devices, these applications will steadily expand over the coming years as enterprises find new and innovative ways to their workforce more productive by offering ubiquitous access to enterprise data. The number of off-the-shelf systems and tools for customized solutions will also grow steadily. These wireless platforms generally fall under two broad categories- smartphones which possess full-blown operating systems and can run enterprise applications and wireless PDAs integrated with cellular, Wi-Fi or both. This market research study provides detailed qualitative and quantitative analysis of the global market, estimating the market till the end of 2016. The report also provides a comprehensive review of major market drivers, restraints, opportunities, Winning imperatives, challenges, and key issues that are widely prevalent in this market. 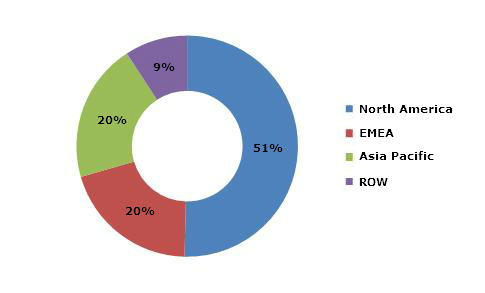 The market is further segmented and forecasted for major geographic regions, North America, Europe, Middle East, Africa, Asia-Pacific and Rest of the World (ROW). The Competitive scenario and market share of the top players in the market has been discussed in detail. The top players of the industry are profiled in detail with their recent developments and other strategic industry activities. We have used various secondary sources such as encyclopedia, directories, and databases to identify and collect information useful for this extensive commercial study on Wireless Platforms Market. The primary sources – selected experts from related industries and selected suppliers have been interviewed to obtain and verify critical information as well as to assess the future prospects. In value terms, the global market stood at $61.5 billion in year 2011 and is expected to reach $155.2 billion by year 2016, at 20.3% CAGR during the projected period. On the basis of product type: This market is segmented on the basis of wireless baseband, wireless broadband, wireless processors, wireless power management integrated circuit (IC) and wireless sensors. On the basis of application: This market is classified onto data processing, communications, consumer electronics, automotive and industrial. On the basis of handset & tablets: This market is classified onto air interfaces, OEMs and operating systems. On the basis of geography: This market is classified onto North America, EMEA, Asia Pacific and ROW. Wireless platforms have become an integral part of mobile computing, consumer electronics and will act as primary focal-point for product innovation in the near future. The wireless technologies offers low-power and low-cost platform that makes it possible to expand the value of the end user products. It is segmented on the basis of product type, application, handsets & tablets and geography. The market by product type is classified onto wireless broadband, wireless baseband, wireless processors, wireless sensors and wireless power management integrated circuit. The market by application is classified onto data processing, communications, and consumer electronics, automotive and industrial. The handsets and tablets are segmented onto mobile handsets, smartphones and tablets. The mobile handsets market is classified by air interfaces and OEMs. The smartphones market is classified by OEMs and by operating system. The tablets market is classified by type, by operating system and by geography. The global wireless platform market is expected to increase from $61.5 billion in 2011 to $155.2 billion by 2016, registering a CAGR of 20.3% during 2011-2016. In terms of geography, North America is leading the pack in terms of revenue; it is expected to reach $80.1 billion in 2016, registering a CAGR of 20.7% from 2011 to 2016, followed by Asia Pacific and Rest of the World (ROW) which are leading in terms of growth rate as the market in this geography is in a nascent stage and many improvements are being made in telecommunication infrastructure sector. The global market is fuelled by wireless deployments in businesses at an accelerating pace owing to increase in capable devices at affordable and attractive prices, cost-effective, reliable and quicker wireless networks being deployed across wide areas and expansion in the array of mobile applications.